By the Way: Is this a sign? I know better but I am feeling surly, so I am gonna tell you how I really feel. I am not sure if I am more accommodating or meaner in person, don't much matter. For now I feel the venom flowing so I am going to let it flow. 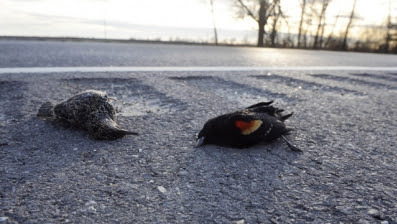 Birds are dead. Falling from the air. Thousands of fish have washed up on lake shores. What is the most popular Yahoo news clip? Snooki's book deal and workout routine. You know, that twit from that pathetic Jersey Shore program. She gives dumb asses and slutty chicks a bad name. New Jersey already has a bad name. Joke from high school: A girlfriend tells her boyfriend to kiss her where it smells, so he drives her to New Jersey). She's so newsworthy. What do I really expect from Yahoo!? They give great tips for successful job interviews. You know: be on time and don't pick your nose. Also on how to look young by brightening your teeth and using a moisturiser, because really how could the average person ever discover those ideas on their own? I am equally as irritated with Arianna Huffington. How can she claim to have any connection with blue collar hard-working Americans? I am fairly sure she never has spent anytime with the down-trodden in downtown Detroit. She married into huge money and now runs around with her blue-blooded liberal cronies. And how long has she been in this country and barely speaks English? I know, but I am sick of her lispy ramblings. I think all these multi-millionaires, ie: Gates, all the A-list movie stars, Buffett, Oprah should collectively start a social services bank account for our very own poor and give back. Really give back. They could really do a lot for the lower- middle classes. Man, there's people right here that don't eat. (However. they may have an i-phone, which is another post.) Put their money where the mouth runs rampant. 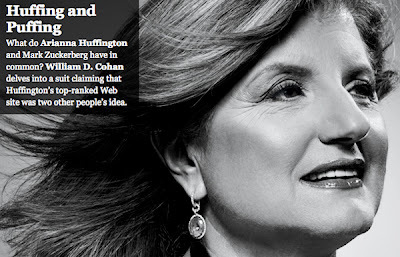 Her Huffington Post is now being sued by former writers. They claim it was their idea. It isn't her first brush with material lawsuits. From Vanity Fair, can't wait to read. Is this all a sign? I am afraid a sign of the times. Tomorrows another day, goodnight. C.